/ Modified mar 8, 2017 7:35 a.m.
Cardiac surgeon from Texas gets regents' unanimous vote to replace Hart. 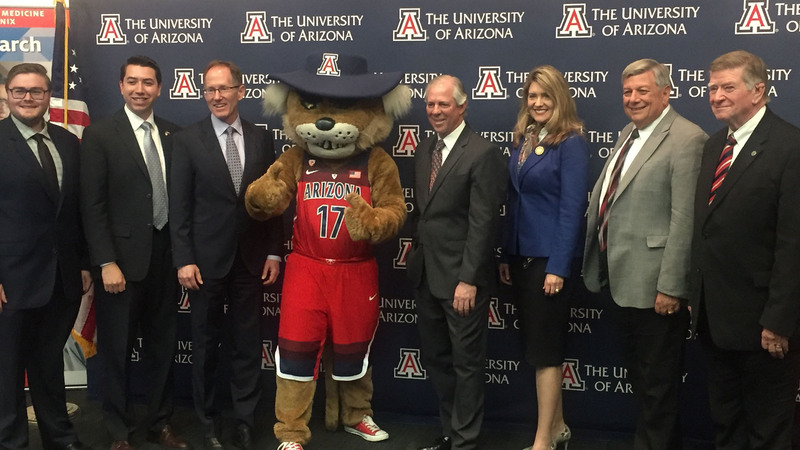 Robert Clayton Robbins, fourth from the right, poses with the University of Arizona mascot and members of the Arizona Board of Regents at the press conference announcing the vote to make him a finalist for UA president. Robert Clayton Robbins, head of the Texas Medical Center, was named Tuesday as top choice for president of the University of Arizona. The Board of Regents selected Robbins in Phoenix following interviews with him and one other candidate Monday. Robbins will meet the campus community and the public at a forum Wednesday afternoon. The regents will vote next week formally to make him an offer, and contract negotiations will begin. A final vote on the contract is expected April 6, based on a timeline the regents released last week. Robbins, who serves as president and chief executive officer at the Texas Medical Center, said at a press conference Tuesday he was eager to get on the road to Tucson. He said his top priority will be the UA's students. "I look forward to meeting them, working with them, and helping them be prepared for this new world that we’re living in now," he said. "It’s changing rapidly, and as the university family we’ve got to treat each one of them like our own children and help them be prepared for not just the four years they spend on campus, but the next 40 years of their life." The announcement was delayed by more than an hour late Tuesday afternoon as members of the Board of Regents met privately to select their top candidate. Regent Bill Ridenour, who headed the search committee, said the delay was not a sign of disagreement. "We just wanted to be very thorough," Ridenour said. "When you get nine people in a room that have differing thoughts, you want to make sure that you give those people every opportunity because it’s important, we think, that we be unanimous. So we are, and we are, and we’re excited." 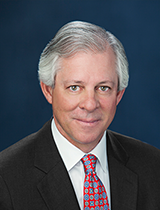 Robbins is a cardiac surgeon who joined the Texas Medical Center as its president and CEO in 2012. In that time, he introduced five research initiatives centered on innovation, genomics, regenerative medicine, health policy and clinical research. The Texas Medical Center is the largest medical complex in the world, a press release said. “Dr. Robbins’ comprehensive experience as both a visionary leader and highly-respected physician, as well as his evident talent for advancing research, innovation, entrepreneurship and economic development will serve the University of Arizona and our state well,” regents' President Eileen Klein said in a press release. As a surgeon, Robbins has focused on acquired cardiac diseases with a special expertise in the surgical treatment of congestive heart failure and cardiothoracic transplantation. His research work includes the investigation of stem cells for cardiac regeneration. The other finalist was Sethuraman “Panch” Panchanathan, executive vice president and chief research and innovation officer at Arizona State University. Current UA President Ann Weaver Hart will step down after her successor is chosen. Hart will take a one-year sabbatical leave and return to the UA as a professor in the College of Education. She became the university's first female president in 2012 and announced last year she would not seek renewal of her contract in 2018. UA President Robbins: 'I'm Going to Be Accessible' Why New UA President Is Million Dollar Man How Much Will Robbins Make As UA President?